Wednesday and Thursday were dedicated to shearing and moving goats and sheep into their pens for breeding. Mamas got split from babies, which is resulting in a fair amount of fussing. Barbara and her daughters are by far the most vocal. By next week they will have settled into a new routine. 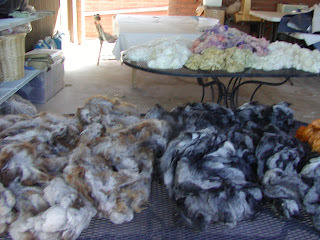 I ended up with 14 lovely fleeces and washed four of them immediately. The rest will have to wait until I get back from Taos. 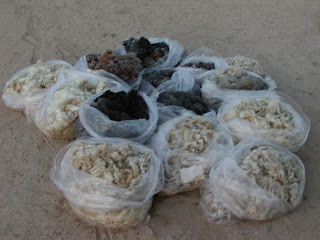 No Size's fleece is one of the ones at the front of the pile. Even marc was impressed with it. Still as nice as a typical kid mohair, but not as nice as his offspring's hair. These two Shetland fleeces are gorgeous, but really surprised me. The lambs were born with moorit and black. Since they stayed that dark looking, I thought that they would be that color when they were sheared. The Shetlands can be hard to catch, so it was not until Penny started shearing them, that I realized that they had both turned shades of grey. The orange tips are not sunburn, but the color that the lamb was born with. I did not get time to card them, since I really did need to gather up the stuff for the workshop that I am taking in Taos on Monday and Tuesday. One of my friends and I are leaving early tomorrow morning. A friend is covering the shop for me, so I won't feel guilty. The following weekend, I will be at the Patagonia Fall Arts festival, so there will not be anyone in the shop on Saturday. The highlight of the shearing days was teaching Penny, the shearer to drop spindle. With all of the years that she has been shearing, she never learned how. 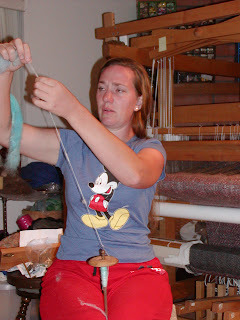 I sent her home with a drop spindle, niddy noddy and a few types of roving. She took to it like a natural. I will be teaching her to knit next time she comes. You have to do something with the yarn! If I am able to get access in the hotel, I will post while I am gone.